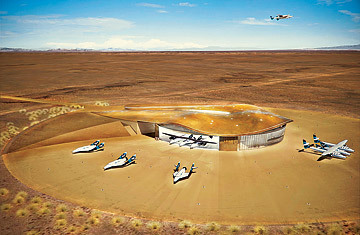 Tickets at Spaceport America (architect's rendering) will start at $200,000. The coyotes have loped off, and the rattlesnakes have crawled under the construction trailers for shade and safety. Bulldozers have scraped away the mesquite to make a board-flat rectangle 10,000 ft. by 200 ft. Workers have begun putting down layers of gravel, packed earth, asphalt and concrete 42 in. thick to form a runway. The age of space tourism is here.